You may know the tropical beauty Aglaonema (Aglaonema spp.) as the Chinese evergreen. Because the plant is limited to outdoor growing in U.S. Department of Agriculture plant hardiness zones 10b and 11, it is usually grown indoors. In its outdoor growing range, the plant works well in shade gardens, borders or used in mass plantings. The Chinese evergreen is poisonous and inappropriate for homes with small children or pets that like to chew on plants. Chinese evergreens tolerate dense shade but those with variegated foliage look their best with a little light. 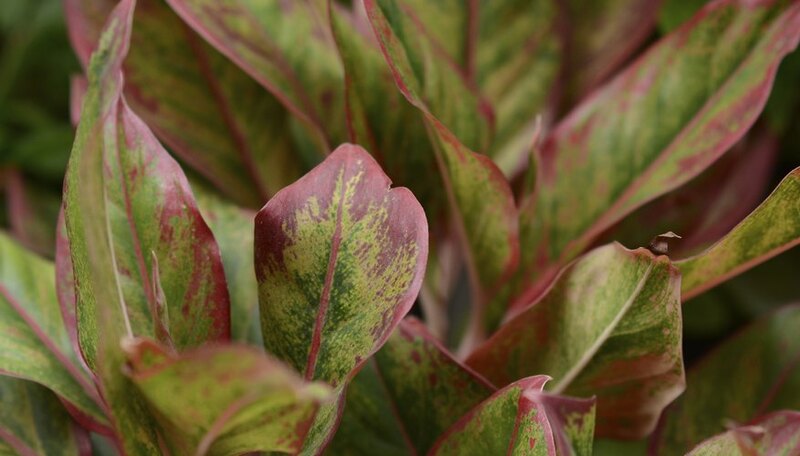 Aglaonema X "Stripes" has banding of silver and green throughout the foliage. Direct sunlight will scorch the leaves and turn them yellow; setting the plant near a north-facing window is ideal. The best temperature range for the plant is between 68 and 77 degrees Fahrenheit. When grown outdoors, plants prefer growing in an area receiving 75 to 90 percent shade and tolerate temperatures to 55 degrees Fahrenheit. The hybrid cultivar Aglaonema X "Golden Bay" handles temperatures dipping as low as 45 degrees Fahrenheit. Plants injured by frost produce grey and greasy spots on the foliage within one week of the occurrence. Disinfect pruning blade by wiping them off with bleach and allow the blades to dry before pruning off the affected foliage. Drench the soil when you water the Chinese evergreen, watering until the excess runs from the bottom of the pot. Insert your index finger into the soil, up to the first knuckle, and when it feels dry to that depth, water the plant again. Overwatering creates problems with rot. Add 2 teaspoons of a 9-3-6 liquid fertilizer to 1 gallon of water and water the plant with the solution every three weeks during the growing season. Water grown-grown plants weekly to keep the soil moist but not saturated. Reduce fertilizer amounts to half if foliage turns brown and brittle, as too much salt has built up in the soil. Flush the soil with water to remove the excess salt. When given the proper care, Chinese evergreen is a robust plant, requires little pruning and has few pest or disease problems. Prune off dead and brown foliage and emerging flower spathes for a fuller plant and to prolong the plant's longevity. Foliar diseases can be avoided by not allowing the foliage to become wet when you water. If you suspect that your plant has been infected, isolate it from other plants and remove infected leaves. Dip the shears or scissors into a solution of 1 part of household bleach and 9 parts water after each cut to avoid spreading the disease. Spider mites, scale, mealy bugs and aphids sometimes are problematic to indoor-grown plants. Knock the bugs off by spraying the plant with water, or use a ready-to-use insecticidal soap spray and saturate the plant's foliage. Repeat weekly if required.